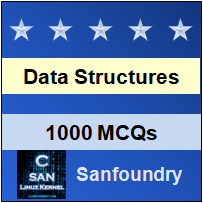 This set of Data Structures & Algorithms Multiple Choice Questions & Answers (MCQs) focuses on “Ternary Tree – 2”. 1. How many extra nodes are there in Full ternary tree than a complete ternary tree? Explanation: Every Full ternary tree is also a complete ternary tree. Therefore, both have same number of nodes. 2. Is Node A sibling of Node D in the given ternary tree? Explanation: Node B, Node C are the siblings of Node D while Node A is the parent node of Node D.
3. What is the size of the given ternary tree? Explanation: Size of the ternary tree is defined as the total number of nodes present in the tree. Since there are total of 6 nodes in the ternary tree. So the size of the ternary tree is 6. 4. Who is the ancestor of Node G? Explanation: Ancestor node is a node that comes in between the path from the node to the root. Since Node C comes between node G and root, so Node C is called the ancestor node. 5. Who is descendant of Node B? Explanation: Descendant node is a node which has a direct path from ancestor node. Since both E and F are connected to B, so Node E and Node F are the descendants of Node B. 6. What is the size of Node A? Explanation: Size of node is defined as the total number of descendants of that node including itself. So, size of Node A is 4. 7. Can leaf node be called child node in a ternary tree? Explanation: Leaf node is a node that has no child. Since Leaf node will always be the node on the last level of ternary tree, so it can be called child node of given parent node in ternary tree. 8. Can child node be always called Leaf node in the ternary tree? Explanation: Leaf node is any node that does not contain any children. Child node may or may not contain more nodes. Child node will only be called leaf Node if the node has no child node. 9. Which of the following is the implementation of the ternary tree? 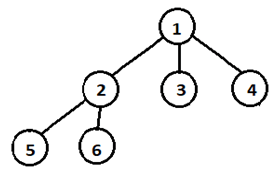 Explanation: Ternary tree is used to implement ternary search tree and ternary heap. While AVL Tree, hash Table, dictionary are different types of Data Structures.